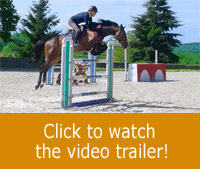 This exercise is an excellent warm-up to jumping courses. Despite the simplicity of the set-up, this full range exercise enables the rider to work his horse on staying on a precise and straight track while approaching fences with a steady rhythm. This exercise is also a good practice exercise for the rider’s mind since the rider has to stay focused on all her priorities, especially her position. This exercise can also be a good practice for speed challenges since the rider can modify the path by tightening more or less her turns. The ultimate goal is to work in perfect connection with the mount in order for the rider to influence her horse as little as possible to stay on the path at a steady rhythm. In this session, Michel Robert is teaching Marine and her mare Amanda. The first step of the exercise consists of a set-up of flexy-jumps placed on the ground. The set-up consists of an easy path but encourages the rider to quickly alternate between turns and straight lines. For the second step, the ground poles are replaced by fences which height can be modified depending on the outcome and the level of the rider and horse. We can notice how influential the rider’s weight is, on the quality of the precision of the path. The capability of the rider to let the movement go through is essential to pulling this exercise together nicely. 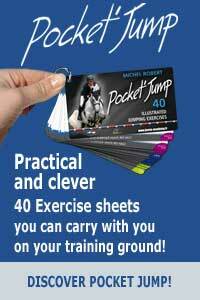 Michel offers solutions that the rider can use on this exercise but also on a full course or in shows.